When I was around five, I had a Shetland pony named Little Bit. I still remember him a little bit. I know, I know … I’ll be here all week. I ran across this picture of the two of us on my computer recently. I love old photos. I scanned a lot of our old family photos into my computer a few years back and I’ve been so thankful to have them. It’s definitely worth the time and effort and it’s such a treat to look at these every so often. This picture is of me with Little Bit. This was probably like circa 1976. It was definitely taken at my grandparents place in “the mountains.” My grandparents fixed up this place and moved up there for good not long after this photo was taken. I like the particular way I have my head turned — as if I’m trying to catch the light just right. Maybe I was wanting the camera to focus more on my stylish pin-striped overalls. Now back to Little Bit. Most little girls have warm fuzzy memories of their first horse. You know, memories like galloping through the open field with the wind blowing your hair. The smell of daisies floating out on a breeze. A sweet pony who listened to all your secrets, hung on your every word and ate apples for a treat. My memories of Little Bit aren’t really like that at all. I remember that he was slow and wouldn’t really gallop at all — no matter how hard I kicked or sweetly I begged. I remember that he was likely one of the most stubborn of animals I’ve ever met and he always looked about ten seconds away from a nap (as evidenced in the photo above). I also remember that he liked to bite. 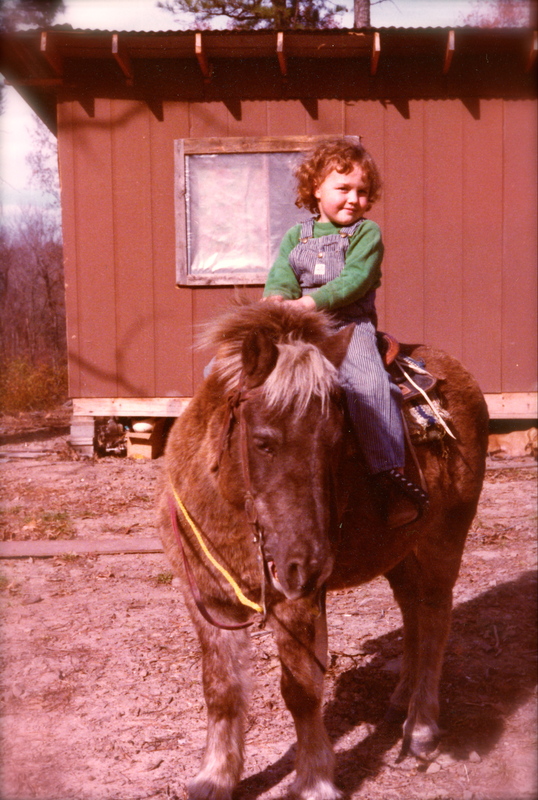 I now think that my grandparents probably conspired against me and got me the very safest pony they could find. One that didn’t walk very fast. A horse that kept me standing firmly on the ground tugging on his halter trying to get him to wake up! Devious. My grandparents, that is. But, the best memory of all is how much I loved Little Bit. To me, at that time, he was the best horse ever. He also taught me many things like … how to pretend you are awake when you are really asleep (see his tutorial above). Thanks Little Bit — you were a good pony. ← Corn Dogs and Funnel Cakes … Oh My! Yes, I think we only made it through half of Aunt Gails photo albums! Yes you only did about half. I still need a copy of all those. Can you put it on a disc? I never got to see them after you copied them. Loved the pony. I’m pretty sure I said this Friday night…”I bet you were a cute kid”…If I didn’t say it out loud, I said it in my head…and I was right. Your sweet face brings a smile to mine.